Ventura Dreaming: It's Hard to Hate Something This Cute But . . . It's Hard to Hate Something This Cute But . 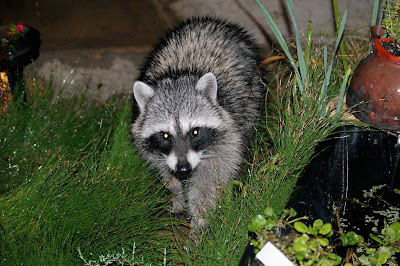 . .
After weeks of waking up to a vandalized fish pond, I finally met the culprit face-to-face in the wee hours of the night last night. As you can see, he was quite wet and had already been in the pond several times. Whenever the ScareCrow would shoot him/her with water, the raccoon would run away. A couple of seconds later, it headed back into the pond. Tom threw little rocks at it but it seems quite at home under the house and in our yard! 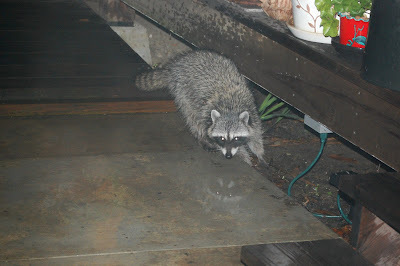 It's too bad I've always been fascinated by raccoons and their cute faces and intelligent ways. Now that the koi are safe in their deep pond, I've gotten used to losing goldfish once or twice a year. 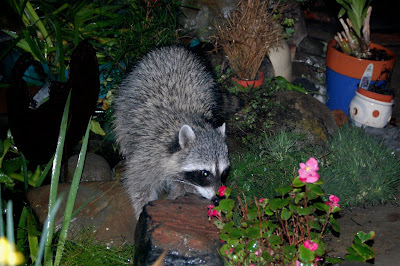 If they didn't do so much damage to the plants and fountains, I could live with these masked varmints.